With this module, new server deployments can be created automatically and even pre-configured. As a reseller, when your customer provisions a VPS, this plugin allows them to display their instance’s bandwidth and monitoring information from within the WHMCS client area. Your customers can also easily provision additional services, such as load balancers, and complete management tasks, such as reboots, restores, and more, all with the click-of-a-button. For detailed instructions on how to install, setup and use our plugin please see our articles here! You will find a series of posts that detail the steps to get setup and create your first product! 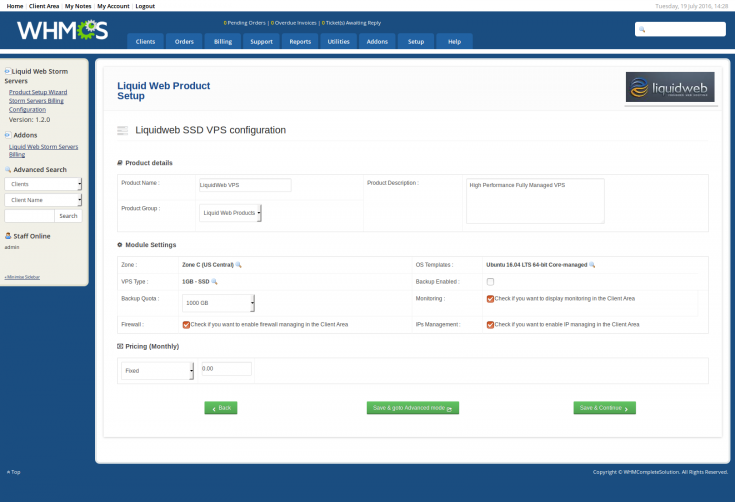 If you're looking for alternative installation instructions please read Liquid Web WHMCS Plugin Installation Methods. Didnt know such plugin exists. Now We can resell more stuff like VPS! i was looking how to to do white label on VPS , but now no need to look further! I do wish that it created an easier path to simply getting server space provisioned to my customers through whmcs. It seems like most of the information that I have to input to whmcs comes from my server/cpanel/whm anyway. Instead of rooting around manually in there, if this allowed me to sort of “plug and play” when I need to provision space to my hosting customers, I would happily pay for this. Definitely took us at least 15 man hours to finally figure this out, and we still needed help. $100 investment for that would be a drop in the bucket in comparison. Great plugin! Makes it really easy to start reselling Liquid Web's Storm Platform. *Wizard page api credentials fix *Template name was printing in 'Client area backup page'. *Module was calling hundreds of api calls (especially Network/zone/list) when loading product detail page in client area. 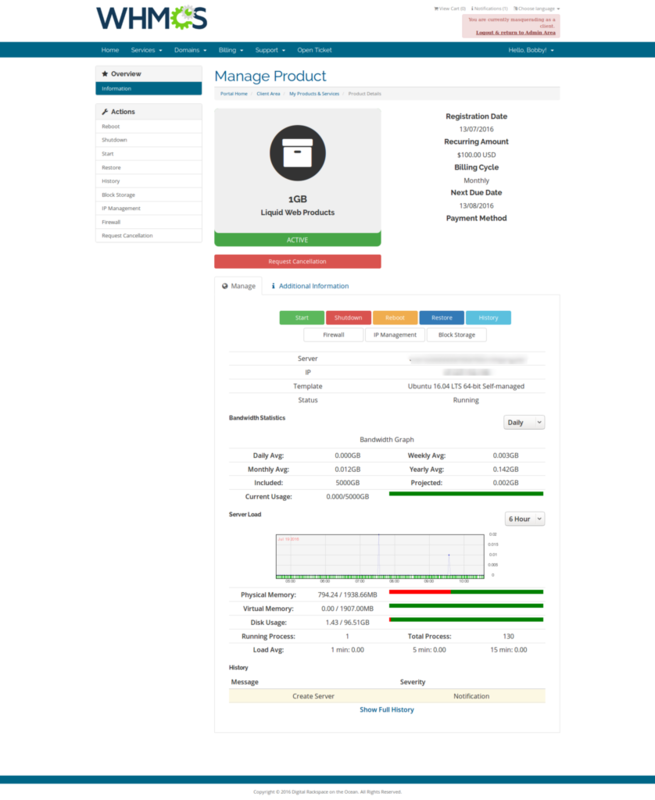 *Product (VPS/PP) details in client area loads much faster. *Docs: updated chown command *removed unused serverUrl variables *Adding the text "Please note that this may take 30..." under the load wheel *Adding price column to the product setup wizard and also when loading configs *Removing the % based price calculator from the product setup wizard *Added "Deprecated" message for "StormOnDemand" modules. *Hide non working configurations *Caching admin page widget data, data gets updated from WHMCS cron. *Docs: Add license and update readme. *Docs: Add CHANGELOG.md file; transfer known changes into new file. Minor updates for WHMCS 7.1.1 compatibility. For full details please view the Github commit log for detailed changes. · Added configuration page for reseller to select that they use a custom theme to accommodate custom theme names to execute required scripts. · Slider control for Memory and Diskspace. · CREATE "I want to give my VPS the following hostname" for entering the hostname for the customer. · No modify option in wizard, instead it should create new products each time. · On save and continue go to first page of the wizard.